A formation of Mirages led by Lt Col Avi Lanir, commander of 101 Squadron Israeli Air Force, intercepts MiG21's over the Syrian Desert on 9 November 1972. In the ensuing dogfight two of the Syrian MiG's are shot down, one of them from a direct hit by Lanir to score his second MiG victory. 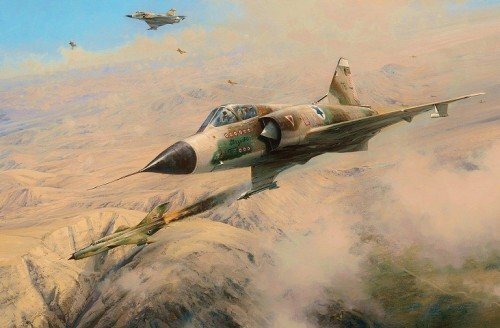 Created with the direct input of one of the greatest Jet Aces of the Supersonic age, Giora Epstein, this spectacular piece is a tribute to one of the greatest fighter leaders of the Isreali Air Force, Lt Colonel Avraham Lanir and depicts an arena of aviation combat that is seldom featured. Col. Giora Even Epstein - The highest scoring Jet to Jet Ace in history with 17 confirmed victories.